The last time we were at Dartford Folk Club must have been around 1988 when we went to see a then fairly youthful Pete Coe, so we were well overdue a return visit. Luckily, the only thing that’s changed is the venue. Now held in the function room of the towns working men’s club, music is still put on weekly, it’s seamlessly organised and maintains those lovely traditions of floor singers and the half time raffle. It was also very well attended and although some of the younger members of the crowd were obviously there to see Luke, the vast majority seemed to be club regulars who all knew one another and would come week in week out. The floor singers introduced the evening nicely, a little ‘house band’ providing back up for some whistle tunes and songs and then three traditional numbers from an unaccompanied singer, which of course provided ample opportunity for crowd harmonies on the numerous choruses. 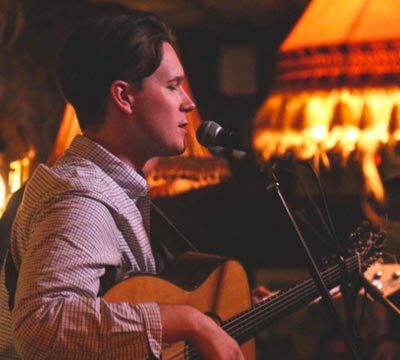 Although he loosely fits in the Folk world, Luke gigs in all sorts of venues and environments and I think it had been quite a few months since his last set in a formal folk club setting. If he and Andy had any nerves about how they might be received, none were evident as they launched in to the brooding metaphor of opening song ‘Honeycomb’, followed it up with the soulful pop of ‘Is it Me’ then soothed the audience with the breathtaking harmonies on ‘Aimee’, a bittersweet tale of two strangers crossing paths briefly before heading on their way. The connection between Luke and Andy was obvious and their playing together was tight, intuitive and respectful. Andy serves to expand the songs with his harmonies and endlessly creative bass playing where he not only provides a rock solid rhythm but often adds counterpoint melodies to Luke’s guitar lines. The best example of this was on ‘Cherry Picker’ with it’s witty, almost throwaway lyrics and as Luke was riffing on his guitar during the extended instrumental fade out, Andy threw in lead lines from his bass. I imagine it’s a long time since a bass this funky has been heard in a folk club! Luke then put in three slower numbers where you could hear a pin drop. A beautiful take on Bob Dylan’s ‘Forever Young’, his own heartbreaking song ‘A Queen In Her Own Way’ about his Nan who died just over a year ago then he nailed the audience to the flow with a sublime version of Sandy Denny’s ‘Who Knows Where The Time Goes’. Luke really holds his vocal in check here and although he does have a remarkable voice, these days it always seems in service of the song, not at the expense of it, which is as it should be. So, not a dry eye in the house but any reflection was smashed with a rocking new original song ‘Eliza Holt’, the tale of a young girl incarcerated in an old Victorian asylum when she becomes pregnant. This is a great story in the good old folk traditions and it’s not hard to imagine Fairport Convention picking up on it and giving it the Matty Groves treatment. After the raffle, club announcements and trip to the bar where there prices are very fair indeed, it is on to the second set. Luke dips into his back catalogue for a thumping ‘Sister’ and then another of his story songs but one he hasn’t played for a while, ‘Father and Son’, which talks about the relationships in a traveller family where the Mother can’t abide the restless life and wants to settle down. It’s back to something more chunky with ‘Fathers Footsteps’ and ‘Finding Home’ before another very new song is showcased. ‘Heavy’ muses on the experience of male depression but it’s set to an almost Otis Reading soul ballad setting with archetypal ‘Stand By Me’ bass lines and an outstanding, impassioned vocal from Luke. ‘Red Oak’ follows and is another hauntingly beautiful story song featuring those good old staples of war, love and loss before a further very new one, ‘Baby Boomers’. It’s not very often Luke writes an obvious, non ambiguous social comment song and this is a great place to start, not a word wasted and acutely observed this is a fine song. The second set ends with a punchy blues version of Solomon Burke’s ‘Cry To Me’ and after much applause they return for Luke’s perennial encore song, ‘The Road’, which features the sort of audience singing on the chorus as befits a Folk Club and ended with Luke standing on a chair in the crowd conducting like it was last night of the proms. Lovely folk club, lovely people and lovely music from the boys made for a memorable night indeed.